The brand name comes from the 1960s cycling team Rapha, famous for its love of drinking St Raphaël after a long ride, whilst the logo is inspired by that of Citroën’s H Van. 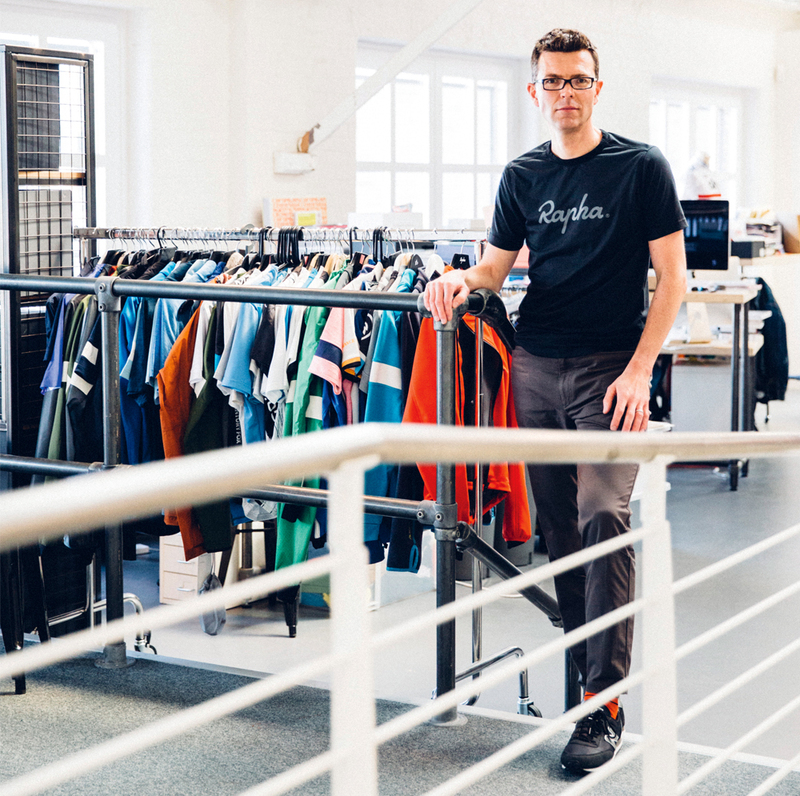 Founder by Simon Mottram, a Chartered Accountant who got creative at Interbrand, and Luke Scheybeler, a digital designer with Sapient who preferred to design fashion, Rapha makes luxury cycling clothing fusing high tech fabrics with sporting nostalgia. Walk into a Rapha Cycle Clubs – in London or New York, Sydney or Osaka, and you can see, smell and touch a love of cycling. The business has grown rapidly, building a direct relationship with consumers, through events and online community, as well as its coffee-shop stores. There are also line extensions into luggage, skincare, books and travel. Tour de France and Olympic champion Bradley Wiggins, and his Team Sky wear Rapha, whilst there is a co-branded range with designer and cycling enthusiast Paul Smith. Rapha is a brand that polarises opinion. For some it has created the ultimate in high performance equipment, dedicated to a sport that breeds passion and perspiration. For others, it is over-priced and over-designed vanity wear for middle-aged men who have taken up weekend cycling in recent years. Whichever your view, it gets talked about. Especially items such as the $450 pair of yak-leather cycling shoes, or the $150 pro-glide coffee tamper, to flatten your coffee like the best baristas after your run. Inside Rapha: Is it just branding? One of the first things that catches your eye on entering Rapha HQ are the race numbers located around employees’ desks. “When you join Rapha, every employee gets a silk race number,” explains head of R&D, Simon Huntsman. “It shows how long you have been here.” Huntsman is number eight and proudly proclaims that he is “the longest standing employee after founder Simon Mottram” — No.1 naturally. Rapha may be a cycling success story with an ever-growing presence out on the roads but the company, started in 2004, is not operating out of a gold-plated skyscraper yet. HQ — titled the Imperial Works — is actually a former abattoir somewhere around the back of Kings Cross Station. The vibe inside is typical of a creative 21st century start-up: post-industrial and open-plan with walls festooned with cycling memorabilia. But he believes the business has been successful precisely because it’s focused “on a particular part of the market rather than trying to be all things to all people. 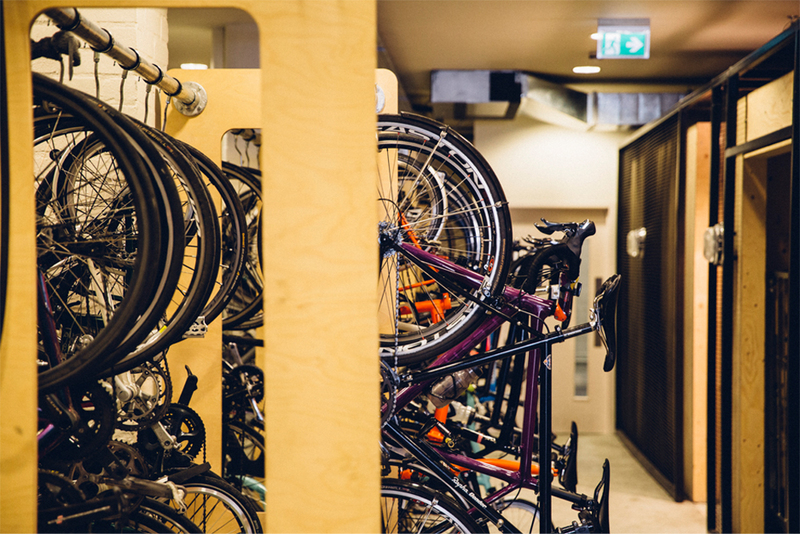 Indeed, the bike racks downstairs are full and it’s estimated that at least 90 per cent of the staff regularly travel to work by bike. It’s not just commuting either: Wednesday is company ride day when staff are encouraged to ride, even if they’re busy. Having staff that ride is important to Rapha. “All the product team ride and that knowledge gets extracted and put back into the products,” claims Huntsman. For instance the O-ring zip pullers that have become synonymous with Rapha products “came from needing to locate your zip puller really easily” when overheating on a climb. Huntsman also cites Rapha’s gloves, which feature two different tried and tested pads on the back of the thumbs for wiping away sweat and snot. If Rapha was already getting plenty of insight in-house, they gained a whole load more when they took over from Adidas as kit supplier to Team Sky at the beginning of 2013. Although the relationship will end this season, they’ve found that working with a core group of team riders who are particularly interested in their kit has reaped rewards. And when it comes to matters of personal preference, chamois type and leg length on shorts is entirely up to the rider. Working with the team is not always at the cutting edge. Remember that mesh jersey that gave Chris Froome sunburn? “It came from Sky that they wanted an open mesh,” Huntsman explains. It’s from Huntsman’s R&D department that new products, some including technologies borrowed from other industries, are devised and prototyped. Working with a long-term focus, they’ve recently been researching yarn technology for crash protection, wearable tech and biometric data. “We are actually looking at heating elements and lighting in garments too,” explains an excited Huntsman. There are, he notes, other companies working on some of these things — but they want to “do it the Rapha way”. Why do cyclists love or hate Rapha? When it comes to cycle clothing, one brand polarises cyclists like no other: Rapha. The very word will leave some purring at the thought of their next visit to its Soho store, while others will twitch involuntarily at the very mention of the name. Forums see these two entrenched camps trading blows, which often fall below the waistline. Rapha occupies a position in the high-end sector of the market and there’s no denying that its clothing is expensive, but premium fabrics and construction deliver performance and longevity. I rate their kit highly, but it is not infallible. I’ve always been puzzled as to why Rapha in particular is the focus of such ire from a substantial section of the cycling community. And it’s not just the brand itself that seems to raise their shackles. Anyone who wears their kit is deemed guilty by association. Shouldn’t we be celebrating such a globally successful and innovative British brand? Do we ridicule someone who chooses to wear designer jeans over a pair from Primark? And if so, how many of us would own up to the fact that a little bit of envy lurks behind our sneers? Conversely, roll up for your pre-ride espresso flaunting a new set of aero wheels and your cycling friends will whistle in admiration. A common accusation levelled at Rapha is that it is a brand that is all about style, but would Sir David Brailsford with his mantra of ‘marginal gains’ have teamed up with a kit supplier that was concerned solely with image? Simon Mottram always envisaged its clothing would offer superlative performance and the Team Sky sponsorship gave impetus to this objective. It was a symbiotic relationship: Rapha found a wider, global audience, while the clothing it supplied to the Sky squad helped to secure two Tour de France victories and a smattering of Classics. The partnership, Mottram noted when announcing that they were parting company at the end of this season, had provided success “beyond expectations”. The Shadow range is one of the final manifestations of their relationship, but can Rapha justify that hefty price tag? It claims that the bespoke yarn, comprehensively tested, represents the pinnacle of its technology and delivers unrivalled wind and rain protection. “It has a fantastic range of movement and fit and, that crucial difference, amazing breathability,” claims Graeme Raeburn, Rapha’s lead designer. Sales already suggest that many are prepared to pay a premium for extensive R&D. The innovation will trickle down to the mid-market manufactures in due time. Where Rapha go, many follow. Rapha celebrates road cycling and though that does not make it unique in the industry, few can match its commitment. Its website regularly posts inspirational essays, videos and photography; Rapha sponsors events, invests in grassroots and women’s cycling and its Super Cross series continues to grow in popularity. Mottram even resurrected the Bordeaux-Paris endurance race, once a staple of the pro calendar, raising £200,000 for an autism charity in the process. Sure, this all helps to promote the brand, but its heart is in the right place. It’s no surprise, therefore, that a principal perception of Rapha is that it is too aspirational and only for the wealthy. Mark Bourgeois, 47, is executive director of a London-based listed property company, who only started road cycling two years ago. Those credentials alone suggest he is the classic Rapha customer, but he describes himself as a ‘cycling chameleon’. During the week he trains with Rapha CC, but every weekend he heads home to Yorkshire, a traditional cycling hotbed, where he rides (and races at Cat 3 level) with Ilkley CC. He admits to being quite self-conscious when wearing Rapha clothing up north and has identified a breed of anti-Rapha cyclist in Yorkshire: “They tend to be those who have been riding to a high standard since their teens. It’s possible they feel a certain resentment that Rapha has sort of stolen their sport and made it their own,” he suggests. Many critics of Rapha have a less romantic connection with their sport, rooted more in the heritage of the domestic cycling scene. To them, it’s all about how you cycle. The unwritten rule of road cycling is to always acknowledge another rider on the road. It’s the recognition of a kindred spirit and a shared passion. Hopefully the day will come when the two parties on either side of the Rapha divide lay down their cycling caps and accept that we are all cut from a similar cloth.